The Hellenistic period is a time of great development for the artistic invention of mosaics, as well as the prosperity of the Greek people. The beautiful and expensive display of cut cubes (tesserae) of stone or glass into a stylized frame was more elaborate than what was previously displayed in Greek art. Hellenistic mosaics are a product of the social and economic conditions of the period and are often on variations of display in the private dwellings of the Greeks. In fact, about 80% of tessellated mosaics from the period have been found in domestic contexts. Houses reveal a great deal about their occupants: people decorate their homes in a style that they feel to be desirable or fashionable, creating a living environment that reflects not only their status, but also their aspirations; in short, they try to present themselves as they would like to be seen by the visitors in their home. The stylistic and technical development of mosaics can be understood as a response to these very personal and yet very publically seen needs. At the beginning of the period, large wall mosaics of natural pebbles were the most common form of decoration. They were most frequently found in the dining room, or andron, and its adjacent anteroom, as they were the principal areas for entertaining guests. Their standard composition, consisting of concentric bands of black and white decoration framing a central motif, seems designed to present a satisfying view to the diners reclining on couches around the walls of the andron. In the observation of these mosaics, it is possible they were intended to impress the outsiders visiting the house, perhaps for a symposium. If this were the case, it is clear that there is a shift in priorities, away from the community of earlier periods, and towards the interests of the individual. This is the beginning of one of the most characteristic aspects of the Hellenistic period. This new influx of wealth and individual prosperity that is revealed in these Hellenistic mosaics began in Macedonia, with the encounter between Greek and Macedonian cultures. The date in the last quarter of the fourth century makes it likely that the spoils of Alexander’s eastern campaigns financed the mosaics, and the lavish houses that held them. These spoils must have made many of the Macedonian aristocracy wealthy beyond imagination. 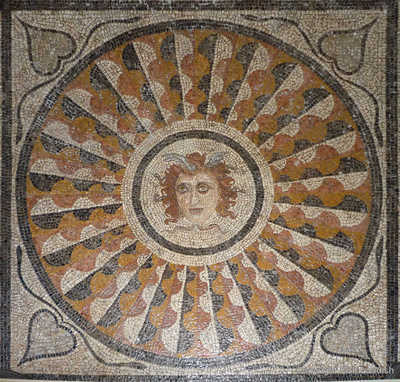 But it was not simply the massive influx of wealth into Macedonia that generated these mosaics: they were also a product of the very different culture and values of the Macedonians. Their monarchic and aristocratic society encouraged individual self-promotion, and they were much less inhibited than the Greeks about private luxury and ostentation. And as Daniel Ogden mentioned in his book, the intention of this seems to be not to foster a sense of intimacy between the participants, but to impress the guests with the host’s wealth and power. For both the cultural fusion that produced these mosaics and the ostentatious entertainments that they adorned are typically Hellenistic. Because of the new flamboyant domestic display of wealth with these decorative house mosaics, a new style was realized. Along with the hierarchy associated with the rich materials and complexity of the design, there is now a strikingly three-dimensional appearance to the scenes depicted that wasn’t seen in earlier mosaics. This is achieved through perspective and shading. Perhaps this is because the size of the mosaic has increased with the size of the room, allowing more surface area for the relatively small pebbles to be placed by the artists in a more realistic and illusionistic way. With the use of shading, known to the Greeks as skiagraphia, the mosaics reflect styles of painting. The artists use different color pebbles, perhaps collected from beaches and riverbanks, to allude the viewer to identify the musculature of the figures with the dramatic and expressive movement throughout the scene. Often times, the mosaic is a mix of pebbles and tesserae, where the pebbles are used to add more texture and contrast for specific elements, such as the hair of figures. The subject matter of these mosaics, often found on the wall or floor of the large Greek houses, ranged from animals to deities, or a simple decorative geometric design, which are an artistic element in their own right. The subject often matched the party, or symposium, being held in that room. Also during this period, small objects with mosaic decoration were made, such as perfume bottles. These were reserved for the elite, for they were very intricate and difficult to make. In the beginning of the Hellenistic period, the host's economic status was shown through his mosaic decoration. Every possible surface of his house and small objects were covered with careful patterns and expensive materials--glass, faience, and perhaps even crystal or mother-of-pearl—in addition to stone. On the walls and floors, the figured and floral elements were exquisite, with delicate shading and illusionistic effects. However, later in the period, the mosaics become less elaborate, with fewer borders, and more white space between the decorated areas. Their decoration consists mostly of geometric patterns, especially waves, three-dimensional meanders and perspective cubes, various types of guilloche, and architectural moldings such as dentils or egg-and-dart. Relatively few depict humans or animals, which is strange, because the later Hellenistic mosaics were mostly made of tesserae, which was invented to make it easier to produce realistic figured scenes. The plainer designs may reflect an aesthetic preference, but they were presumably also cheaper to produce, making mosaics affordable for a wider section of society, yet continuing the trend of private ostentation. Perhaps the increased social mobility and insecurity of the Hellenistic world made it more important to advertise one’s wealth, status, and aspirations, which must have been a driving force behind the spiraling luxury that can be observed in the homes of the period. Rather than the luxury art of mosaics being exclusively made for the elite, they have been adapted and simplified to meet demand from the aspiring classes who wanted to emulate the lifestyle of the elite—a process that continued into the Roman period. "Glass Gold-band Mosaic Alabastron (perfume Bottle)," The Metropolitan Museum of Art, accessed November 1, 2015, http://www.metmuseum.org/collection/the-collection-online/search/249526. Daniel Ogden, The Hellenistic World: New Perspectives (London: Classical Press of Wales, 2002), 135-150. Metropolitan Museum of Art. "Glass Gold-band Mosaic Alabastron (perfume Bottle)." Accessed November 1, 2015. http://www.metmuseum.org/collection/the-collection-online/search/249526. Ogden, Daniel, The Hellenistic World: New Perspectives. London: Classical Press of Wales, 2002.